Sarah Nader - snader@shawmedia.com Doug Snower, founder of Windfree Solar, gives a tour of McHenry County College's solar installation at the Shah Center in McHenry for the Illinois Energy Association's 10th annual Solar Tour Saturday, October 1, 2016. 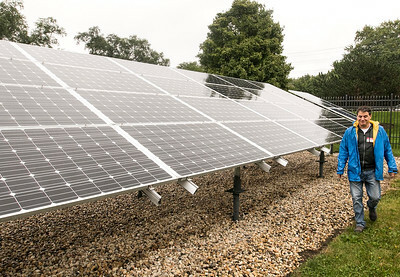 The Shaw Center is among more than 130 solar-savvy home and business owners throughout the state that opened their doors to show off their solar installations. Sarah Nader - snader@shawmedia.com Doug Snower, founder of Windfree Solar, and Kim Hankins, director of sustainability at McHenry County College, give a tour of McHenry County College's solar installation at the Shah Center in McHenry for the Illinois Energy Association's 10th annual Solar Tour Saturday, October 1, 2016. The Shaw Center is among more than 130 solar-savvy home and business owners throughout the state that opened their doors to show off their solar installations. 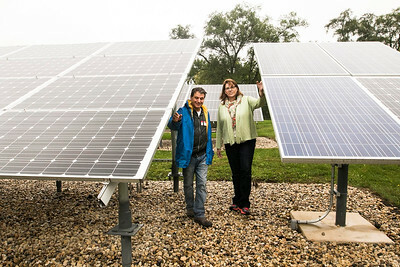 Doug Snower, founder of Windfree Solar, and Kim Hankins, director of sustainability at McHenry County College, give a tour of McHenry County College's solar installation at the Shah Center in McHenry for the Illinois Energy Association's 10th annual Solar Tour Saturday, October 1, 2016. The Shaw Center is among more than 130 solar-savvy home and business owners throughout the state that opened their doors to show off their solar installations.